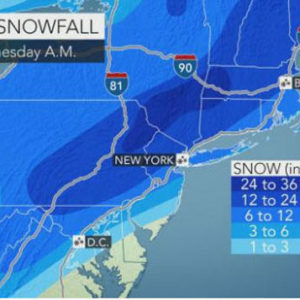 NEW YORK, NY – According to AccuWeather.com, travel delays and difficulties will linger in the wake of the major nor’easter as cold air, gusty winds and a freeze-up plunge across the eastern United States. 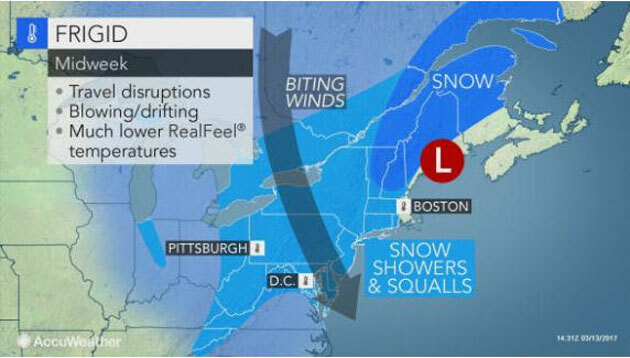 The storm has been responsible for feet of snow, gusts to 60 mph and coastal flooding in the Northeast. The departing powerful storm will also pull another blast of frigid air from Canada through the middle of the week. In parts of New England, gusts can top 50 mph immediately in the wake of the storm. Wind gusts will frequently top 40 mph in much of the Midwest and Northeast through Wednesday. Sporadic power outages can occur. Where the power has recently been cut or is still out following high wind events earlier this month, blustery conditions in the aftermath of the storm will create hardship for some households. Some people will struggle to keep warm. Actual temperatures will dip into the single digits over the next few nights over the northern tier, in the central Appalachians and in some of the outlying areas, where there is snow on the ground. In the major cities, lows will be in the teens and 20s F the next few nights. “Freezing temperatures will reach as far to the south as north-central Florida in the wake of the storm at midweek,” according to AccuWeather Lead Long-Range Meteorologist Paul Pastelok. The freezing air can damage nursery stock, blossoms and young foliage that has begun to emerge in the South. Farther north, the cold flow of air will continue to cause bands of lake-effect snow and sudden snow showers, which can extend well away from the Great Lakes into Thursday. The combination of strong winds and low temperatures will make for subzero AccuWeather RealFeel® Temperatures across the northern tier. From parts of the Great Lakes to the mid-Atlantic, RealFeel Temperatures may be no higher than the single digits through Wednesday night. While the March sun will cause some natural melting of the snow during the day, untreated wet and slushy areas will quickly freeze at night. Motorists and pedestrians will need to keep an eye out for patches of ice, which may appear to be wet. Large piles of snow near intersections will make for dangerous conditions. 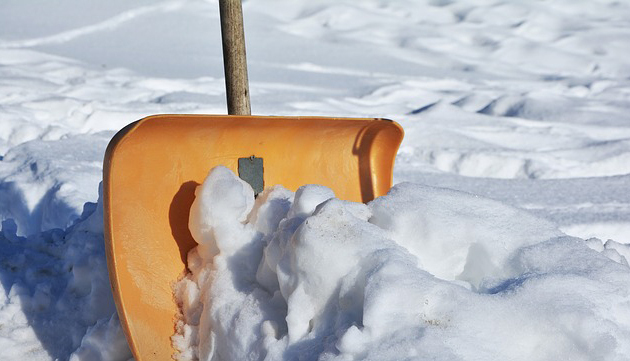 Avoid piling a large amount of snow at the entrances to driveways. Remember to keep fire hydrants free from snow. When possible, avoid parking on streets where snow has made passages narrow. Airline passengers should call before leaving for the airport to check on flight delays, cancellations and re-assigned flights. It may take a couple of days in the wake of the storm for flights to return to normal as many crews and aircraft have been displaced by the storm. Into Wednesday night, gusty winds may continue to cause additional flight delays at some airports. 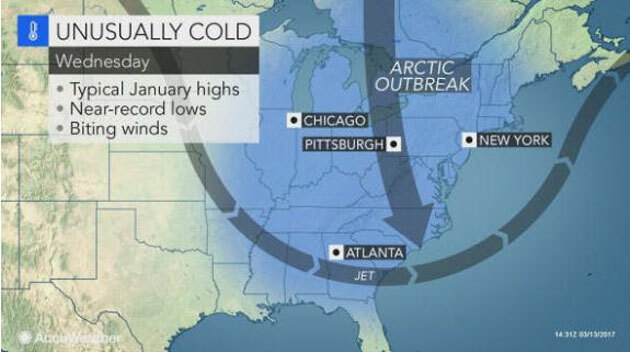 “Cold air that has been displaced southward will come into play during much of the rest of the month,” Pastelok said. Wintry conditions may not be over for the Midwest and Northeast once winds ease in the wake of the nor’easter. 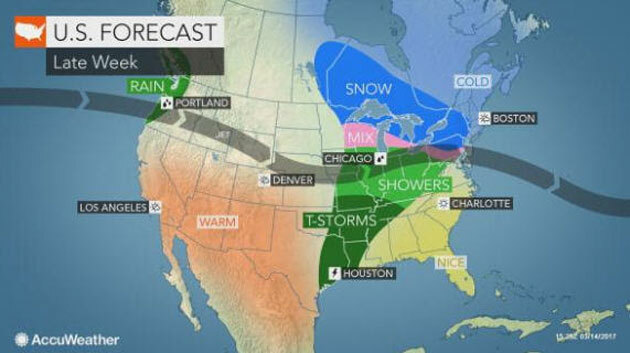 “A fast-moving storm will bring a period of snow, wintry mix and rain to parts of the Midwest on Friday and the Northeast during Friday night into Saturday,” Pastelok said. A couple of additional storms with some sort of wintry precipitation may follow over the Great Lakes and part of the Northeast next week, despite spring’s official arrival on Monday, March 20. 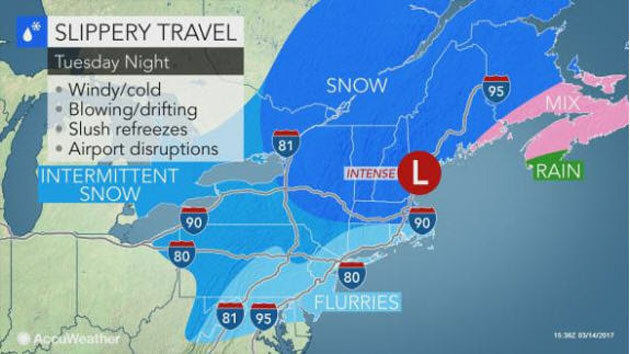 “In addition to the threat for more wintry precipitation over next couple of weeks, the amount of snow put down in parts of the Northeast will increase the chance of flooding problems moving forward this spring,” Pastelok said.